It is late November or December and the thermometer is well below freezing point. 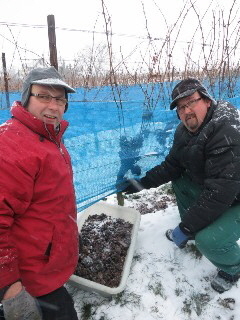 In the vineyard it is still dark, but now is the time to make ice wine! Only a few estates, dedicated to producing the highest-quality wines, will take the risk of not picking some of their finest grapes at vintage time, but to cover the vines with nets or plastic foil to protect from hungry birds or adverse weather, and wait for winter. A winter that sometimes comes too late at the end of January and dashes all hopes. The grapes have to be picked and pressed when still naturally frozen, the ideal temperature being about 9 C (17 F) which crystallizes out the water in the grapes, leaving a massive concentration of grape sugars, fruit acids and extracts. The few drops of highly concentrated sweet must are then fermented to obtain this great German rarity. The difficult task of nursing the must to the finished wine requires the uttermost of experience and care from the wine-maker, but the golden liquid then excels in richness and fine sweetness, nicely balanced by the sizzling & exhilerating acidity. It is this concentration of extract, sweetness and acidity which enables the wine to remain fresh over many years. The maturing process is slow and a good ice wine can still be unveiling its secrets, even after 20 years. 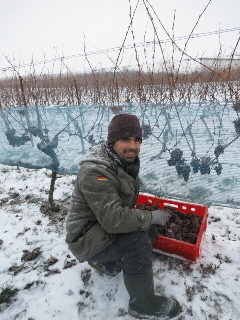 The cold weather arrived along the Rhine valley 8th December with snow, and first grapes for Eiswein were harvested Sunday 9th December, followed on 12th and 13th December. As mentioned in my harvest report, no grapes were left hanging at our estates in the Mosel or Saar valleys due to the small crop. 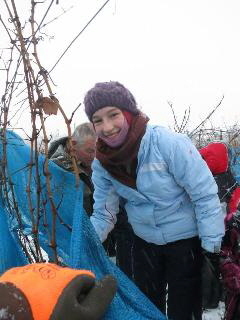 Paul Anheuser - Nahe The Anheusers harvested Riesling at -8C (19F) in the Narrenkappe vineyard at 140 Oechsle on 13th December 2012. Ernst Bretz - Rheinhessen Harald Bretz and his team were able to harvest Spätburgunder, Gewürztraminer and Chardonnay grapes from the Petersberg slopes of Bechtolsheim on Sunday, 9th January, at ripeness levels between 139 and 146 Oechsle. 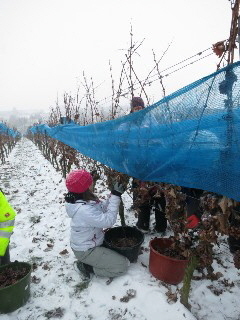 G&M Machmer - Rheinhessen The Machmers and their team were in the Rosengarten vineyard 9th December, harvesting Riesling at -10.5C (15F) with 132 Oechsle and Gewürztraminer at 156 Oechsle..